He is the author of “It Takes More Than a Big Smile, a Good Idea & a Twitter Account To Build a Business That Lasts” and “The Definitive Guide To Infusionsoft.” You can pick his brain as long as you’re providing a fine cigar and a smooth scotch, or by listening to The Sales Podcast, which he has deftly hosted since 2013. Wes served as a meteorologist from 1992 – 1997 in the United States Air Force, towards the end of his service Wes felt he needed a new direction and made a decision to get into sales. Wes talks about his journey leaving the Air Force with a young family. He talks open and honestly about his experience leaving military service and real challenges his family faced. Wes shares the lessons he learned as well as actionable tips for servicemembers and veterans transitioning. Today, he is a distinguished TEDx Speaker, published author, businessman and well known influencer in the sales community. 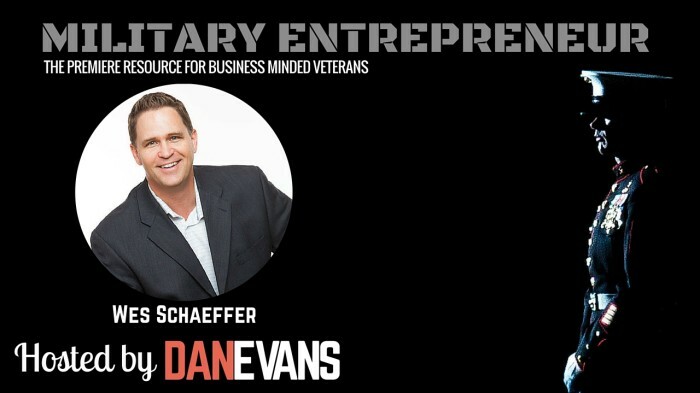 In this episode of the Military Entrepreneur show prepare to get INSPIRED, Wes and I talk about techniques for networking, personal branding, and entrepreneurship.